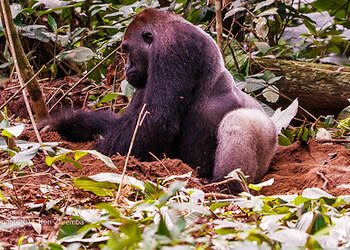 to visitors who want to see Eastern lowland gorillas which are less than 300 in numbers left. The trip includes 2 nights in superb accommodation in Kahuzi Beiga national park located in Bukavu area eastern DRC between Congo basin rainforests and Albertine rift valley one of the biologically diverse areas on earth. It is home to 136 mammals, 349 species of birds, 13 primates including chimpanzees. You will have a chance to explore the flora and fauna during the waterfall nature walk. 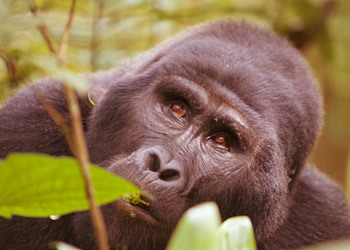 Early morning with packed lunch, embark on the adventure of tracking eastern lowland gorillas with experienced guides. You will be allowed for 1-3 hours to admire take pictures of the gorillas. your will eat your lunch boxes and go for a waterfall walk an opportunity to observe flora and fauna of kahuzi beiga national park. There are more than 300 tropical birds and several monkeys. You will come back to the lodge for dinner and overnight. After breakfast you depart for a tour of Bukavu town passing through tea estates of Mbayo on your way back to Kigali.